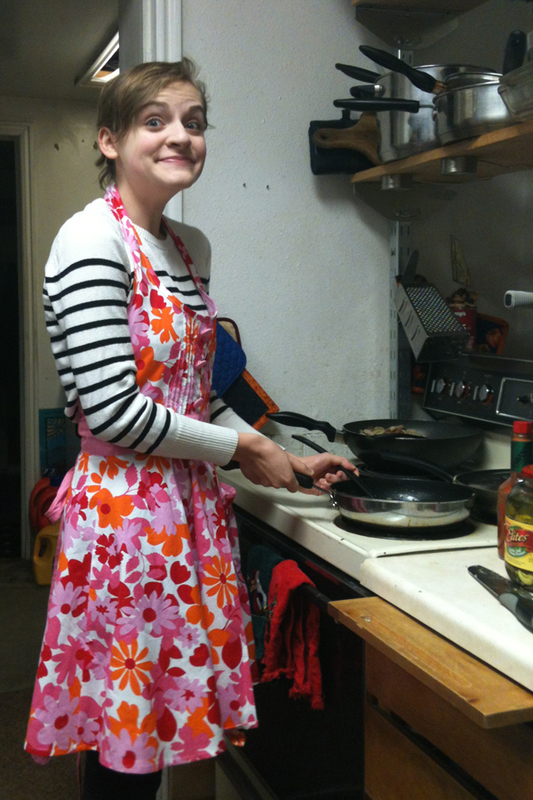 I'm not much of a cook, so I really don't think a lot about aprons. I have to admit I assume that people wearing fancy aprons must be really good in the kitchen. That probably explains the few boring, food-stained aprons I have hanging in the corner. I don't rate a great apron. Grandway recently offered me an opportunity to try out a great apron. They've made vintage inspired aprons that look like adorable dresses straight out of an old movie. I love seeing a company taking a common product in a new direction! The apron I tried was The Lindy. Since I am both large and tall, I was really impressed by the adjustable buttons along the neck. The apron ties are also very long and can be tied in the back or wrapped around again to the front. The idea with these cute aprons is to feel like you can keep your apron on even after your guests arrive. I felt like it was much cuter than the boring black dress I was wearing when I took the pictures. The quality of the material impressed me since I've had a few aprons with material that didn't adequately protect my clothing. Even if I can't cook beyond mac 'n cheese, at least I can look good during the attempt. To show how the same apron can be worn beautifully by women of different sizes, shapes, and ages, I enlisted the help of Dyllen, a quirky drama major who is dating my son, to use the apron as well. Isn't she cute? In addition to these sassy aprons, Grandway has matching pot holders, gloves, laundry bags, and even brooms. Grandway is following the same dream that I had when I started Native & Pilgrim - taking something familiar and putting your own twist on it. 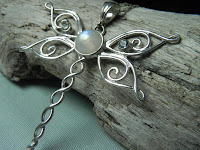 While other people use their tatting skills to make doilies, I prefer to make jewelry and other wearables. We've seen the same Native American and Southwestern inspired jewelry over and over so we modernize the images and even some of the materials. "There are a variety of fabric aprons on the market," Grandway explains, " but we feel like we have added the perfect amount of 'extras' to ours to make them stand out and make them different than other aprons on the market. Gone are the days of taking off your old aprons when company arrives; we have designed the aprons with little fancy dresses in mind so our hostesses can finish their hosting tasks and still look stylish and chic." 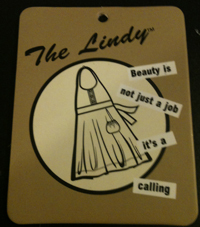 Want one of these aprons for yourself? 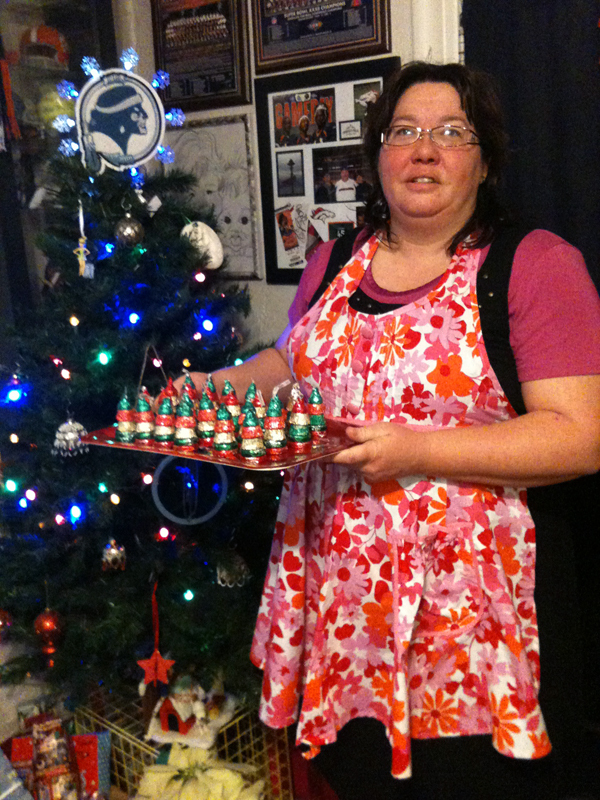 Grandway has provided me with another apron like the one they gave me so that one of my readers can have one. To enter the contest, leave a comment on this post about your favorite kitchen memory. 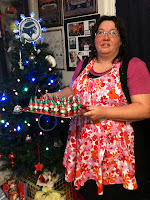 For a second entry, go to my post about this apron on The Spirit Bead Journals and leave a comment there. The drawing will be January 5, 2013. **Disclaimer - Grandway provided me with the apron pictured in exchange for writing a review of it and sent an extra apron to give to one of my readers. All the opinions expressed are completely my own. 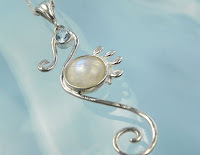 People will sometimes hesitate to purchase handmade items because of the price. They may know of a way to buy a similar item for less money. Usually that means purchasing something that is made quickly and cheaply in a country with lower labor costs. Too often we get tempted to devalue our own labor in order to compete with the lower prices available in a factory environment. All jewelry is not created equally. What I've noticed in wearing some of these pieces is that jump rings aren't fully closed and they fall apart. I was lucky that I found all the pieces to the necklace pictured here when it fell apart. 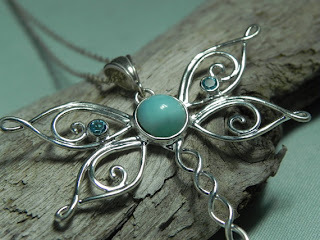 When I make jewelry, I am only working on one piece at a time and I take care to close each jump ring and secure each connection. My attention to detail is part of why I hope customers will choose to buy something I created instead of a $5 necklace from a mass merchandiser. 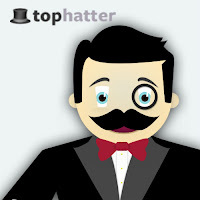 Have you ever tried wearing top quality clothing or shoes? 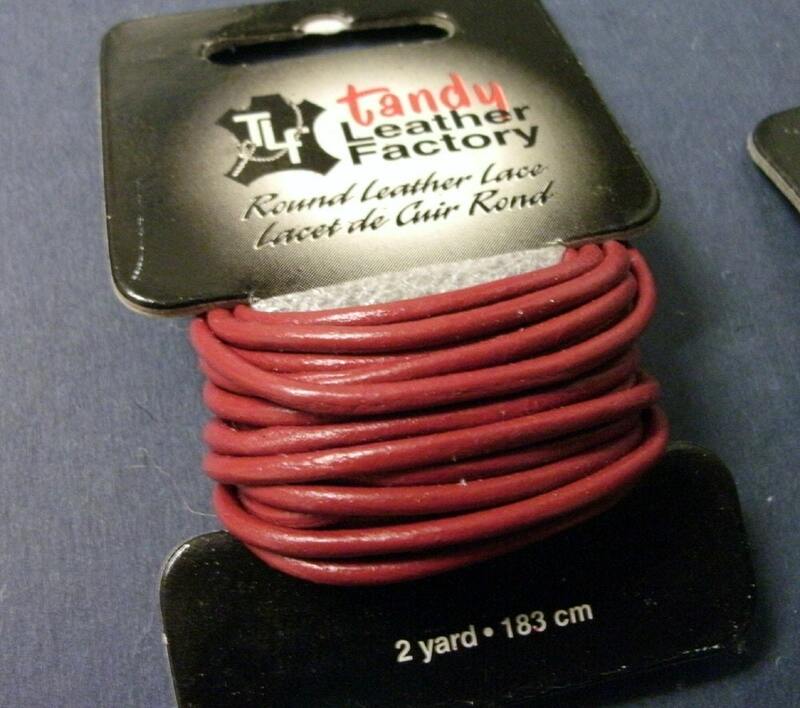 They last longer and look better than the cheaper options. It's your choice whether you want to buy a quality item for $100 or buy something similar for $10 that you have to replace over and over again. When my kids were little, I was okay with buying them cheaper shoes since they grew so fast and needed larger shoes about the same time that the shoes wore out. For my own shoes, my size isn't changing anymore and I'd rather have a quality pair of shoes that will last for years and still look great. 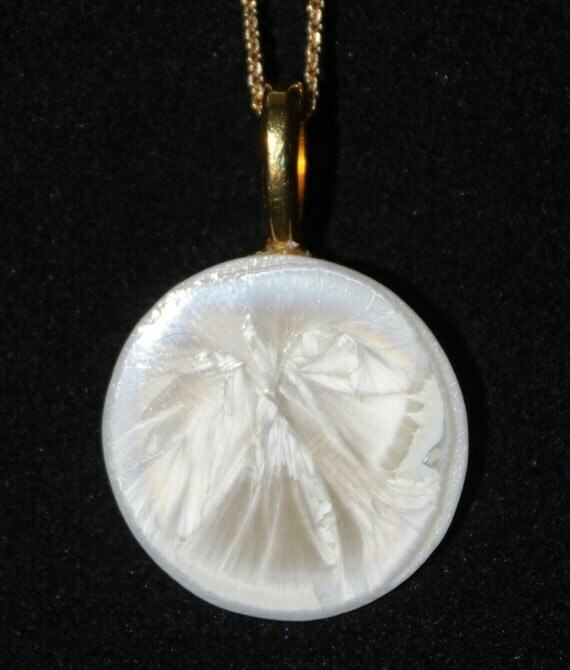 As we continue to sell our handmade creations, we will emphasize the caring and the quality that goes into each piece. I hope my customers realize that it's worth it. I was never a fan of how Etsy charged you a listing fee for each item when you had multiple quantities of the same item. If I make 10 identical pairs of earrings and list them on Etsy with a quantity of 10 being available, Etsy will charge me 20 cents for each, resulting in a listing fee of $2.00. 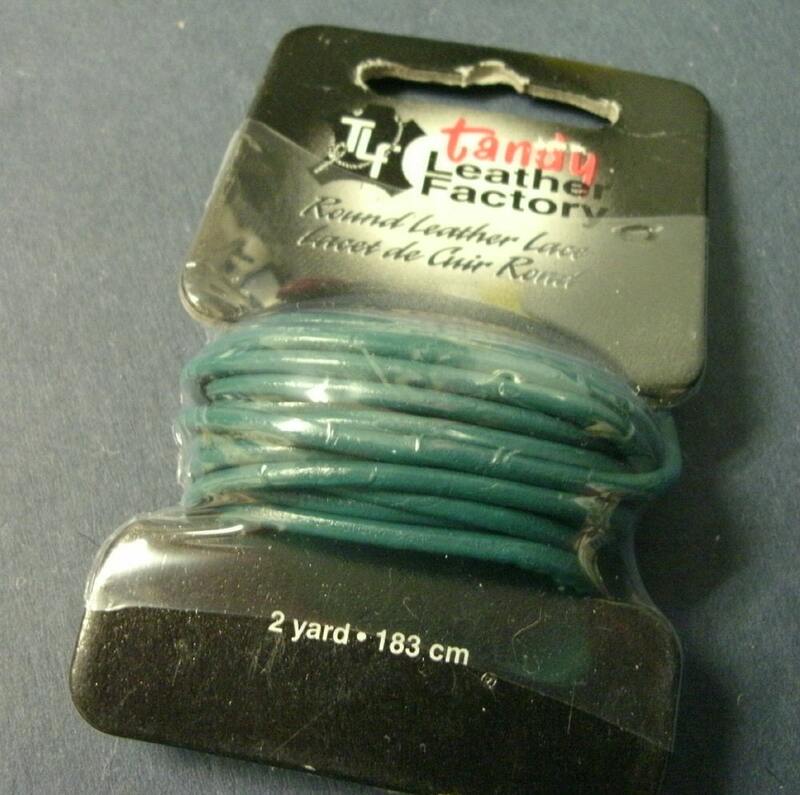 Because of that, I usually just list one item and mention in the description that I have larger quantities available. Etsy seems to have finally come to its senses with this pricing system and is now only charging the one listing fee of 20 cents, even if you have a bunch of the same item. If you sell more than one of the item, Etsy will add the listing fee for each of them, but at least you're not paying multiple listing fees for something that's just sitting there. If you're confused by what I'm saying, you may want to check out this explanation with illustrations. This new pricing policy goes into effect on May 21, 2012. I'm happy I will be able to list multiple quantities without penalty. Now that I've bragged to you about how much I love using Square to process credit card payments on my iPhone, it's time to tell you about some of the other options out there. It's only recently that I've noticed competition popping up. They include new and revamped systems. Vistaprint, a company known for affordable business cards and free samples of other custom imprinted items, sent me a postcard advertising Pay Anywhere. Their service originally charged 19 cents per transaction in addition to the percentage-based processing fee when they started up a year ago. Pay Anywhere recently dropped the transaction fee and now charges only the 3.69% processing fee. Intuit (maker of QuickBooks) has GoPayment. They offer an interesting option that may save money for those who are processing larger amounts of credit card payments. You can pay a monthly fee of $12.95 and the percentage charged for the credit card transactions will drop to 1.7% for swiped cards. One advantage with this system is that it works with QuickBooks. You can also have multiple users on your account so you can have sales going on in various locations, but still be able to track who made the sale. You may have also noticed that PayPal is finally jumping in. When I first started looking for credit card options I could use for live sales, PayPal was the first place I looked. I figured it would be better if all my credit card payments were coming through one payment system. Unfortunately, PayPal didn't have anything available at the time. Now I face a dilemma over whether to stick with Square or switch over to PayPal's system for the iPhone. PayPal Here isn't available just yet, but you can get on the list to be notified when it's ready. Which system should you use? 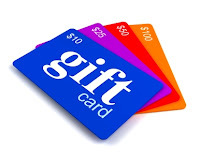 Each one offers the iPhone or Android app and the credit card reader for free. They claim to have no extra or hidden fees and each has a slightly different rate for processing the credit cards. Access to your money is same day (PayPal), next day (Pay Anywhere, Square), or in 2-3 days (GoPayment). There are other features that will speak to one seller more than another, so make sure you read up on all the details. Personally, I'm fascinated by how different each card swiper looks. I have to admit that I'm intrigued by the blue triangle for PayPal...it's so pretty. 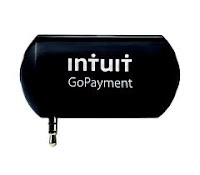 After my experience with Square, I think GoPayment and Pay Anywhere may have the advantage in stability since they look like they'll stay put on the phone as you swipe the card. What system looks good to you? If you've experienced selling your merchandise in person, you've probably noticed that people seem to be willing to buy more when using a credit card. At a previous job, we joked about how the payroll deduction forms were the company "gold card" since it didn't feel like you were really spending money. 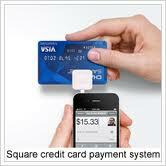 For about a year now I have been using Square so I could process credit card payments when selling in person. The account and the credit card reader were free and the credit card fees were similar to what I was already paying on PayPal. Since it was connected to my iPhone, I could use it anywhere I had cell phone service. Sales tax - You get to decide when to charge sales tax and how much to charge. If you are selling in different locations with different sales tax charges, this is very helpful. Some sellers like to include sales tax in their purchase prices and would want to turn off the sales tax charges. 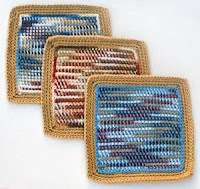 Entering cash transactions - My friend Brittany at Trinkets and Butterflies told me about this one. You can enter all your cash payments in the Square app and keep a nice record of all your sales. Photos of items sold - Square likes to market this as a way for customers to remember what they purchased from you. 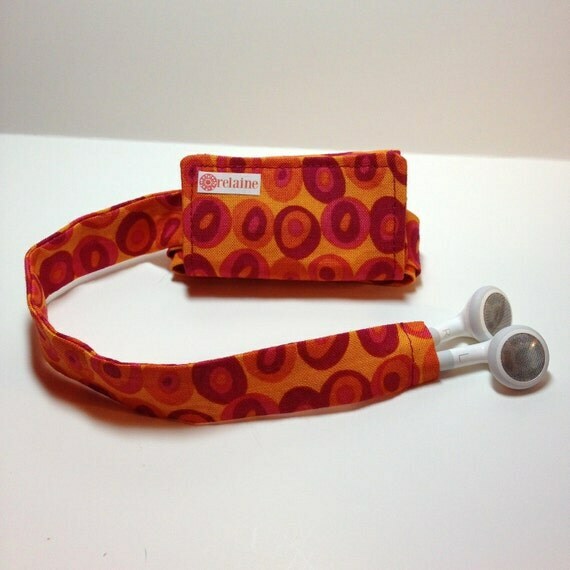 I like it because a lot of the items I sell are unique and the photo helps me remember which item I sold and a photo so I can try to make another item like it. Easy to use records - Not only can I look on my phone to see how our sales went for the day, but the Square website lets me download records as a spreadsheet. More personal than a credit card machine - The customer can watch the entire process and receive receipts by email or text message. They walk away with their purchase without having to leave their credit card number with a stranger. I never liked knowing that a merchant wrote my credit card number down to process it or had the imprint on a carbon somewhere. I get paid! 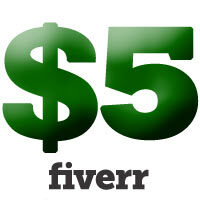 - I don't have to worry about whether the credit card number is any good or whether a check will clear. Square lets me know instantly that the transaction went through. I can't afford to gamble when it comes to having people pay for their purchases. 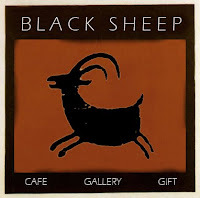 My friends who own Black Sheep Cafe were recently featured in a news article about Square replacing the cash register for some small businesses. They use an iPad and Square's register app that allows them to enter their menu items (with photos). It turns the iPad into a touchscreen cash register that the server uses to assemble an electronic ticket for the meal and process the payment. The customer can even add a gratuity/tip. As a small, eclectic new business, using Square has kept more profits in their pockets instead of paying for financial services meant for large-scale businesses. No, I'm not getting anything in return for praising Square. These are my opinions and experiences, free of charge. 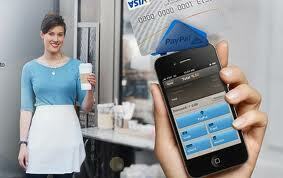 In my next post, I'll tell you about some other companies who are providing credit card processing via smartphone. I recently learned about an amazing product. Unfortunately, I heard about it because they are going out of business. The Swany Walkin'Bag, was designed by a Japanese CEO who is a polio survivor. Etsuo Miyoshi needed a bag that was light, easy to maneuver, and that he could literally lean on for support. With two of these suitcases, he could lean on the extended handles and use them like crutches. Despite the great success of these bags, the downturn in the economy and then supply problems resulting from the Japanese earthquake and tsunami last year led Swany to close their operations in the United States. It's a real shame since these are really amazing bags/suitcases. They're offering my readers an amazing price on their remaining bags. More details about the bags and the discount are on my other blog. Coming up with an awesome and innovative product doesn't always guarantee you success. There are so many variables to success in business that you can't know for sure what will happen. I can think of a lot of examples just off the top of my head. When the home video recorder first came on the scene, the Beta format was the better product, but the VHS format ended up pushing Beta out of the market. Kodak was once king of the photography scene. Unfortunately, they missed the boat on the whole digital revolution. Sony was the top dog when I was a teenager because everyone wanted a Walkman. They were caught napping when more people wanted mp3 players and left CD and tape players behind. I don't say all this to discourage you. It's just good to know that things don't always work out perfectly. If your efforts don't pay off this time, don't give up. Keep trying. Keep creating. You won't know which one of your inventions, creations, innovations, or dreams will be a hit until it happens. 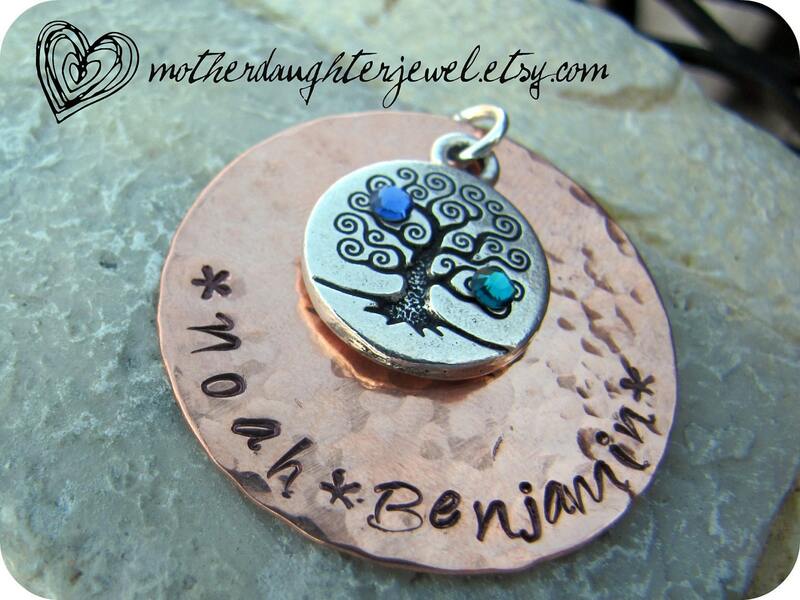 This week I'm featuring Like Mother, Like Daughter hand stamped jewelry. 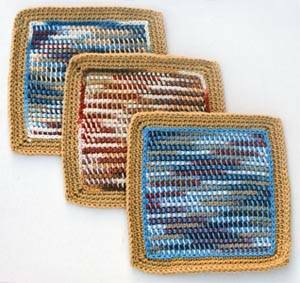 Karen and Kaitlin are a mother and daughter team who have been on Etsy nearly a year. I love that they have more than just letter stamps. 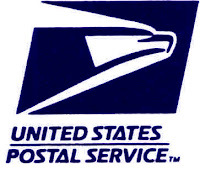 Take a look at all the other stamps they use plus fun charms and embellishments. Each piece is custom made for you when you order it. It sure looks like this team is having fun with their craft. Because this is promoting Etsy shops, I'm not going to require that you add my blog button to your shop (it's not possible anyway). 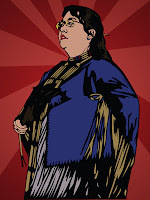 However,I'm hoping you will see it in your heart to add my button to your blog; stay connected to me on Facebook, Twitter, or my RSS feed; and/or promote this link party in your own way. Some of you may have already noticed Etsy's announcement about the launch of Etsy Direct Checkout. Only a few select shops are using right now, but you can sign up to be added to the list so you're notified when it's available. This will give you another payment option besides PayPal for U.S.-based sellers. I've really had no problems with Paypal, so I wasn't too interested at first. After I looked at the fees for the service, I was a little intrigued. Etsy Direct Checkout charges 3% plus $0.25 per sale. PayPal charges 2.9% plus $0.30 per sale. These amounts are very similar, but the fees are slightly less using Etsy Direct until you have sales over $50. A couple of pennies probably won't make a big difference unless you sell a large number of low price items. Etsy will deposit the funds in your bank account each Monday and expects they will appear in your bank account in 3-5 business days. The funds will not be available for deposit until about three days after you mark the item as "shipped." PayPal holds your money until you direct it to do otherwise. You can get a debit card to access your funds. PayPal says that transfers to your bank account take 3-5 days. 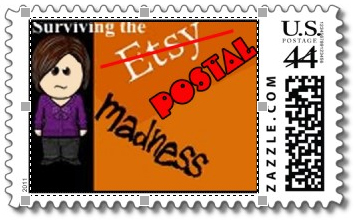 Will you be switching over to Etsy Direct Checkout or staying with PayPal? I was hanging out on Pinterest one night and had a chance to show my oldest son some of the cool origami creations I found there. He's been into origami for years and has come up with his own dragon design. First I showed him some really complicated origami creations, but it was some miniature paper cranes in a glass bottle that ended up catching his eye. That brought on our first ever mother and son trip to the craft store. This is not the son I usually pal around with. He's very geeky (even more than me) and is into Magic the Gathering rather than beadwork and crafting. Going to the craft store was fun and he soon gathered the supplies he needed. He got right to work as soon as we got home. In order to fit the cranes in the glass bottle, he had to make them micro sized. 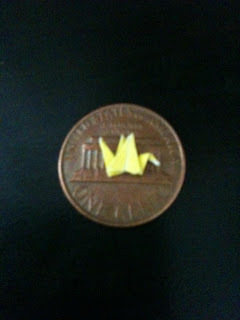 Yes, that's a real penny underneath that teeny tiny crane. He filled the glass bottle with six miniature cranes and then hung the bottle from a necklace cord. It was cute to see him work so hard on it and then anxiously wait for me to add it to our Etsy shop. Interestingly enough, his necklace was viewed 13 times in the first 45 minutes and it was listed in a new treasury within two minutes of being listed. 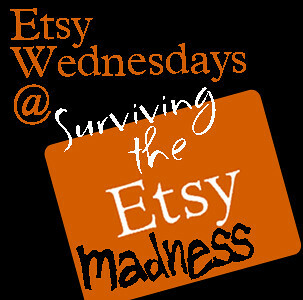 Today I saw a great article about how your kids can help you with your Etsy business. Getting your whole family involved in the business can prevent you from burning out. Having the support without feeling separated from your family will keep you going strong. I've also found that fun new ideas can come from all over, even from your kids. Have you involved your kids in your creating yet? With a name like Ratty Daddy Dinkum, how could I resist? 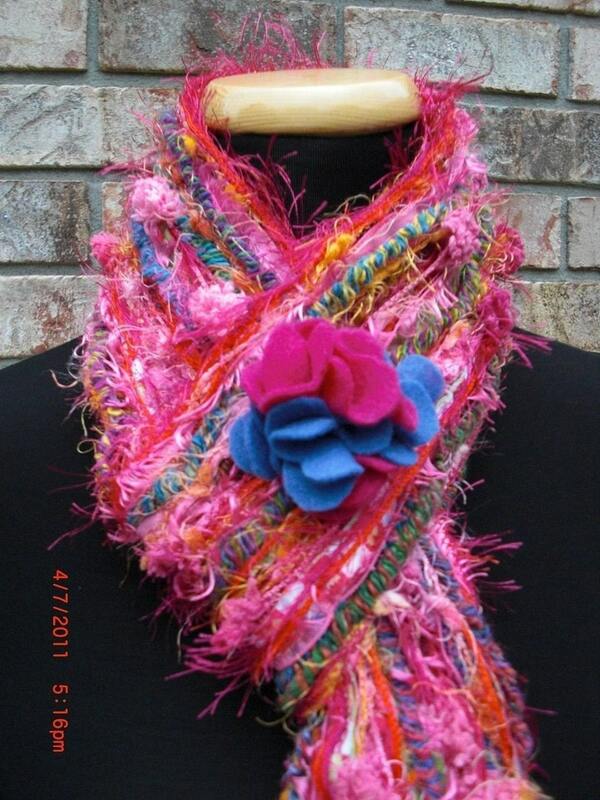 Their Etsy shop with handmade scarves and more was my featured pick from last week's party. Run by a mother and daughter out of Florida, this shop has some fun vintage picks as well as scrappy felt flowers and the scrappy scarves they've become known for.